Variational inference (MacKay, 2003) gives a computationally tractible measure of uncertainty/confidence/variance for machine learning models, including complex black-box models, like those used in the fields of gradient boosting (Chen et al, 2016) and deep learning (Schmidhuber, 2014). The \(MAPPER\) algorithm (Singh et al, 2007) [.pdf] from Topological Data Analysis (Carlsson, 2009) turns any data or function output into a graph (or simplicial complex) which is used for data exploration (Lum et al, 2009), error analysis (Carlsson et al, 2018), serving as input for higher-level machine learning algorithms (Hofer et al, 2017), and more. Interpretability is useful for detecting bias in and debugging errors of machine learning models. Many methods exist, such as tree paths (Saabas, 2014), saliency maps, permutation feature importance (Altmann et al, 2010), locally-fit white box models (van Veen, 2015) (Ribeiro et al, 2016). More recent efforts aim to combine a variety of methods (Korobov et al, 2016) (Olah et al, 2018). Error analysis surfaces different subsets/types of the data where a model makes fundamental errors. When building policies and making financial decisions based on the output of a model it is not only useful to study the errors of a model, but also the confidence: - Correct, but low-confidence, predictions for a cluster of data tells us where to focus our active learning (Dasgupta et al, 2009) - and data collection efforts, so as to make the model more certain. - Incorrect, but high-confidence predictions, surface fundamental error types that can more readily be fixed by a correction layer (Schapire, 1999) [.pdf], or redoing feature engineering (Guyon et al, 2006). - Every profit-maximizing model has a prediction threshold where a decision is made (Hardt et al, 2016). However, given two equal predictions, the more confident predictions are preferred. - Interpretability methods have focussed either on explaining the model in general, or explaining a single sample. To our knowledge, not much focus has gone in a holistic view of modeled data, including explanations for subsets of similar samples (for whatever pragmatic definition of “similar”, like “similar age”, “similar spend”, “similar transaction behavior”). The combination of interpretability and unsupervised exploratory analysis is attractive, because it catches unexpected behavior early on, as opposed to acting on faulty model output, and digging down to find a cause. 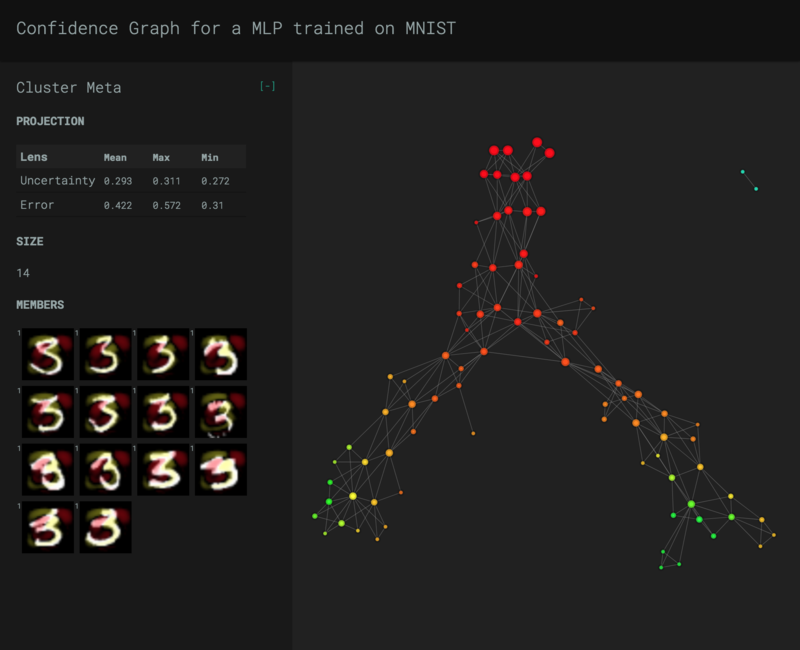 We will use the MNIST dataset (LeCun et al, 1999), Keras (Chollet et al, 2015) with TensorFlow (Abadi et al, 2016), NumPy (van der Walt et al., 2011), Pandas (McKinney, 2010), Scikit-Learn (Pedregosa et al, 2011), Matplotlib (Hunter, 2007), and KeplerMapper (Saul et al, 2017). To classify between the digits 3 and 5, we will train a Multi-Layer Perceptron (Ivakhnenko et al, 1965) with 2 hidden layers, Backprop (LeCun et al, 1998) (pdf), RELU activation (Nair et al, 2010), ADAM optimizer (Kingma et al, 2014), dropout of 0.5, and softmax output, to classify between the digits 3 and 5. We perform a 1000 forward passes to get the standard deviation and variance ratio of our predictions as per (Gal, 2016, page 51) [.pdf]. Closely following the \(FiFa\) method from (Carlsson et al, 2018, page 4) we then apply \(MAPPER\) with the 2D filter function [predicted probability(x), confidence(x)] to project the data. We cover this projection with 10 10% overlapping intervals per dimension. We cluster with complete single-linkage agglomerative clustering (n_clusters=3) (Ward, 1963) and use the penultimate layer as the inverse \(X\). To guide exploration, we color the graph nodes by mean absolute error(x). We also ask predictions for the digit 4 which was never seen during training (Larochelle et al, 2008), to see how this influences the confidence of the network, and to compare the graphs outputted by KeplerMapper. For every graph node we show the original images. Binary classification on MNIST digits is easy enough to resort to a simple interpretability method to show what distinguishes the cluster from the rest of the data: We order each feature by z-score and highlight the top 10% features (Singh, 2016). We create train and test data sets for the digits 3, 4, and 5. Model is a basic 2-hidden layer MLP with RELU activation, ADAM optimizer, and softmax output. Dropout is applied to every layer but the final. Created 267 edges and 100 nodes in 0:00:02.503639.
img = toimage(imresize(image_data.reshape((28,28)), (64,64))) # Data was a flat row of "pixels". /Users/sauln/libraries/kepler-mapper/venv/lib/python3.6/site-packages/ipykernel_launcher.py:36: DeprecationWarning: `imresize` is deprecated! `imresize` is deprecated in SciPy 1.0.0, and will be removed in 1.2.0. /Users/sauln/libraries/kepler-mapper/venv/lib/python3.6/site-packages/ipykernel_launcher.py:37: DeprecationWarning: `toimage` is deprecated! `toimage` is deprecated in SciPy 1.0.0, and will be removed in 1.2.0. Use Pillow's ``Image.fromarray`` directly instead. /Users/sauln/libraries/kepler-mapper/venv/lib/python3.6/site-packages/ipykernel_launcher.py:48: DeprecationWarning: `imresize` is deprecated! /Users/sauln/libraries/kepler-mapper/venv/lib/python3.6/site-packages/ipykernel_launcher.py:48: DeprecationWarning: `toimage` is deprecated!